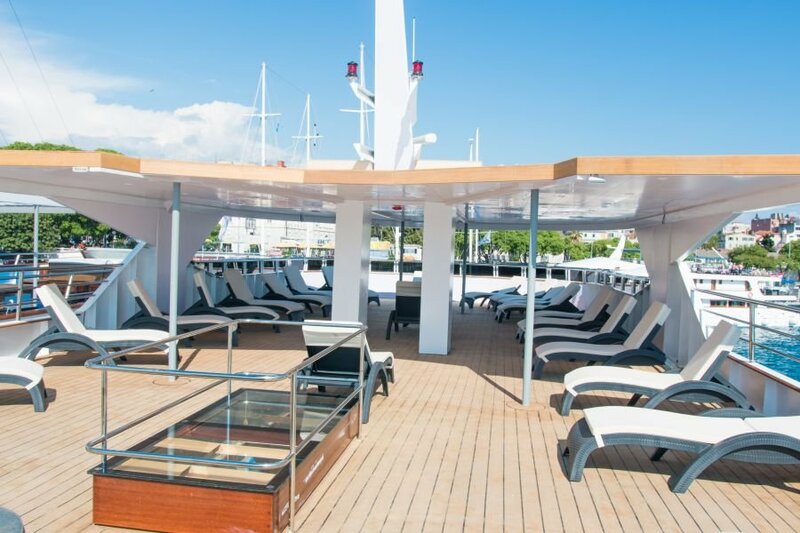 Deluxe vessels visit small historical towns as well as world famous destinations such as Split, Dubrovnik and jet-set island Hvar. Croatia is rich in monumental heritage visible at every step. 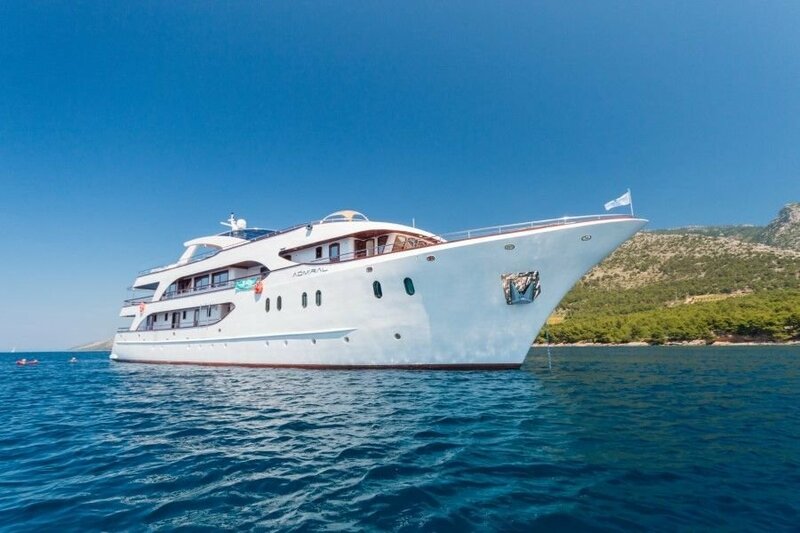 To compliment stunning Croatian coastal towns, wonderful scenery of unspoilt nature is visible during cruising between the islands, and heaven on Earth is experienced on daily swimming stops at secluded bays. Morning departure to Brač island where swimming is planned at the most famous beach in Dalmatia – Zlatni Rat near Bol – whose gravel promontory shifts from side to side as the wind and waves constantly change in shape. Bol is a typical fishermen’s village converted into a popular tourist destination. 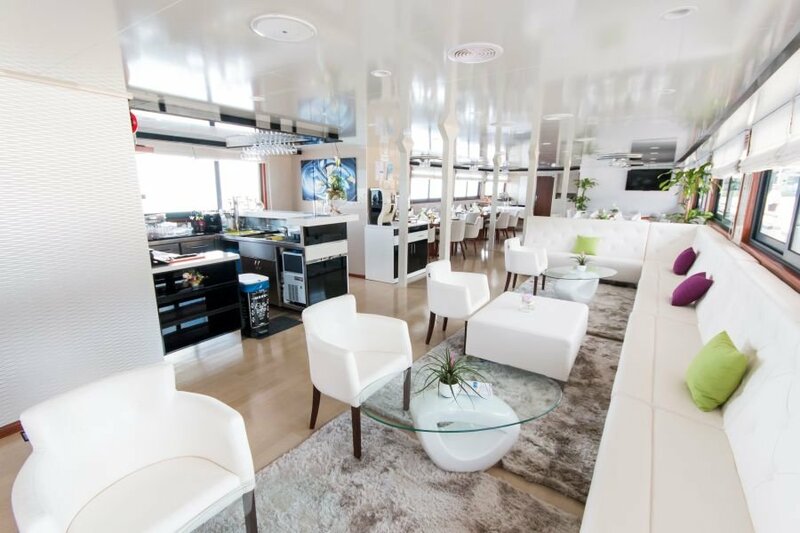 Continue towards the jet-set island Hvar with lunch on board at the Pakleni Islands. Hvar is the longest and sunniest island in the Adriatic known for lavish lavender fields and breathtaking beauty. Afternoon arrival followed by a short presentation of lavender products and a tour of the town’s historical landmarks - the Renaissance cathedral with its original tower, and the oldest community theatre in Europe founded in 1612. Hike up to the town fort overlooking the harbor for some lovely scenic views of your ship and the Pakleni islands. In the evening Hvar offers an abundance of entertainment - numerous restaurants, bars, and cafes are open long into the night. Overnight in the port. 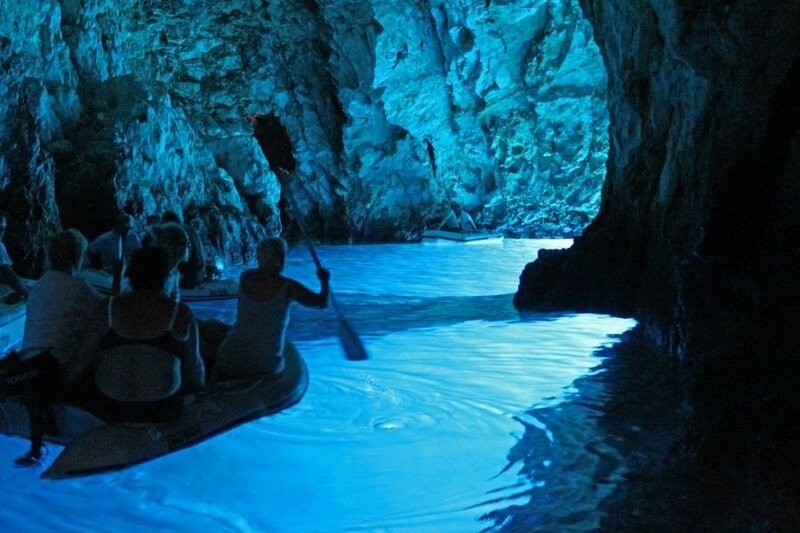 Early morning cruise towards small island Biševo to visit the Blue cave, a magnificent natural phenomenon (entrances to be paid on the spot – approx. 7 EUR). As sometimes weather conditions can be very unpredictable, the possibility of our visit will depend on those conditions, however, you will be notified of this on time. Continue to the island of Vis, once a strategic naval Yugoslav base and closed to the public. Due to this isolation, Vis has a special charm – “the Mediterranean as it once was” making it really interesting to visit. Situated on the northern side of the island, Vis has developed near the remains of the ancient Issa, first urban center in Croatia. Try some exquisite wine sorts in one of the Vis traditional wineries. If interested, visit the remains of the Roman thermal place, City museum or simply take a walk enjoying the views of the beautiful Villae Rusticae situated along the waterfront. Overnight in the port of Vis. Early morning departure towards the Korčula island best known as the birthplace of Marco Polo. Stop for lunch in one of the secluded bays en route. Afternoon arrival in Korčula followed by a guided walking tour of this enchanting town surrounded by walls. and one of the best preserved medieval cities in the Mediterranean. Fishbone street pattern was used in Korčula Old Town design to reduce effects of wind and sun and provide citizens with sheltered and comfortable accommodation. Korčula has an abundant choice of restaurants to enjoy your gourmet experience and there are numerous bars and clubs for those looking for evening entertainment. 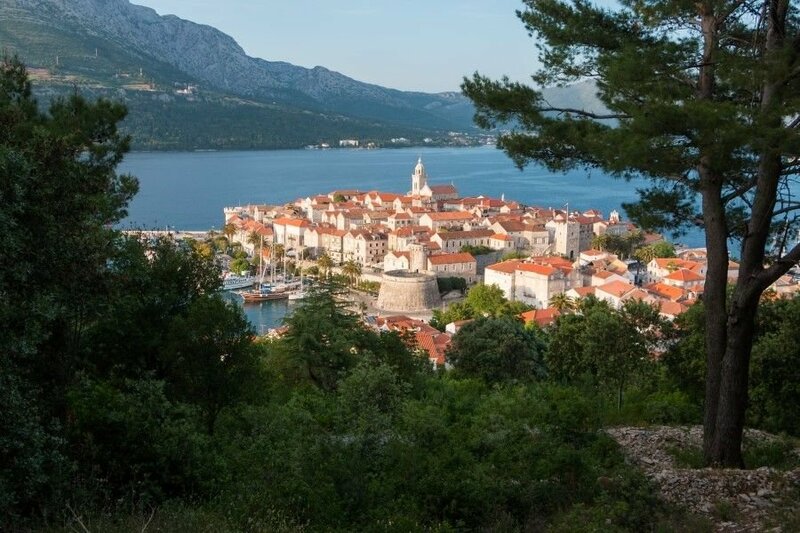 Optional excursion to a small village near Korčula for typical Dalmatian dinner and to find out more about the history and traditional way of living. Overnight in Korčula. 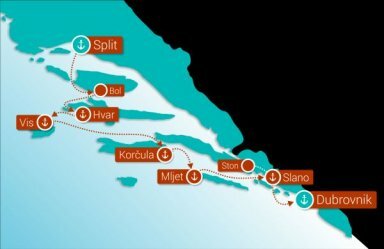 Next morning we head further south to the Island of Mljet. The legend says Greek hero Odysseus spent years on this island when he was captured by the nymph Calypso. 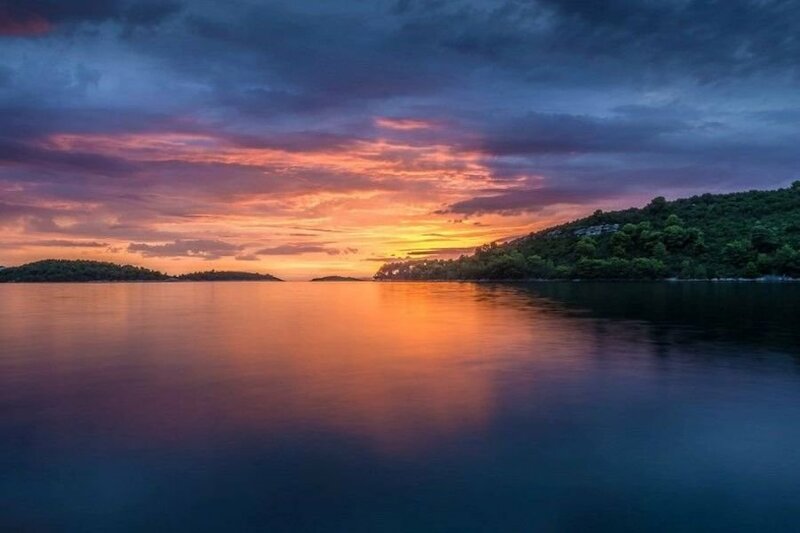 Join the cruise manager for a stroll to the famous salt lakes in the Mljet National Park and enjoy the boat ride to the St Mary Isle to visit an ancient Benedictine monastery, an old abbey and a Church dating back to the 12th Century. Alternatively, you can rent kayaks, bicycles, scooters or convertible cars to roam around the National Park or island on your own, but beware of the nymphs. 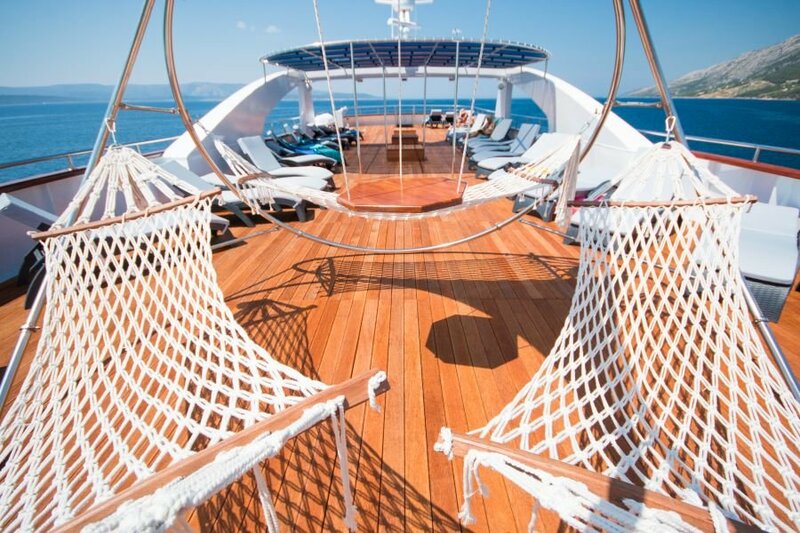 Enjoy the peace and tranquility of the island. 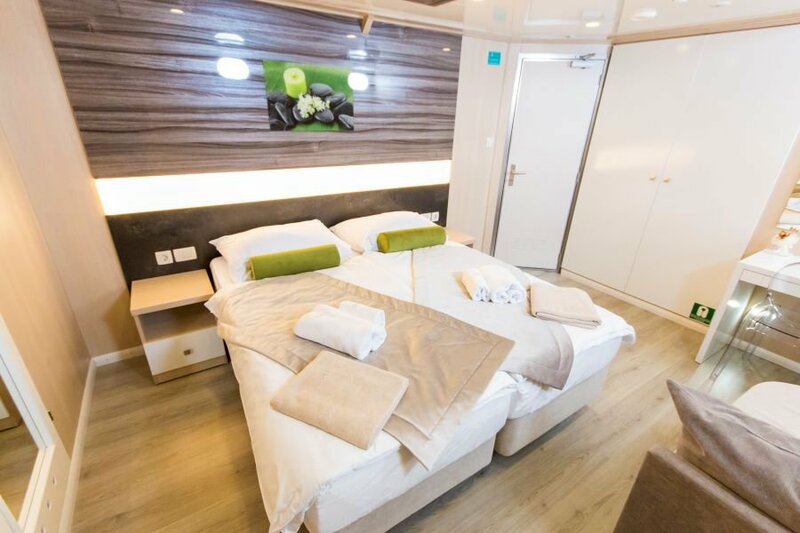 Dinner on board and overnight in port Polača or Pomena. Early morning departure to Dubrovnik - a unique town on the Adriatic. 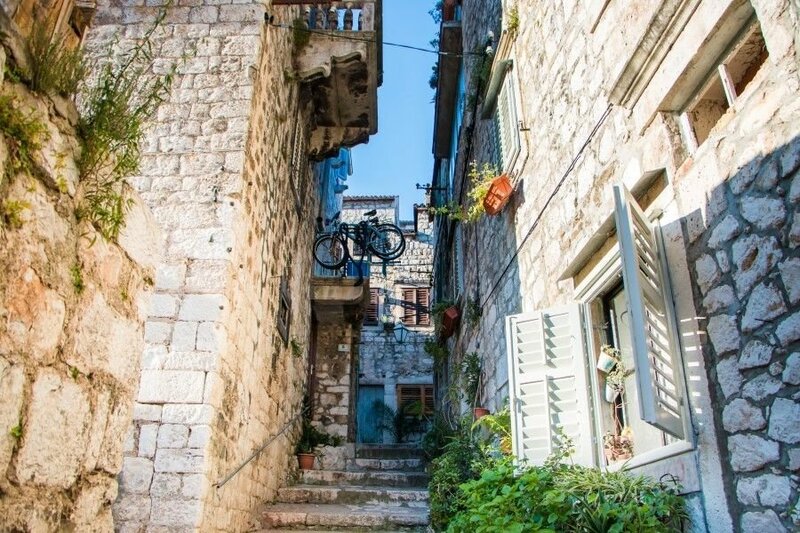 The special charm of this ancient town is the buildings that have remained from the time of the old Dubrovnik Republic. A larger part of the monuments belonging to the modest Renaissance architecture with some traces of the Gothic style. 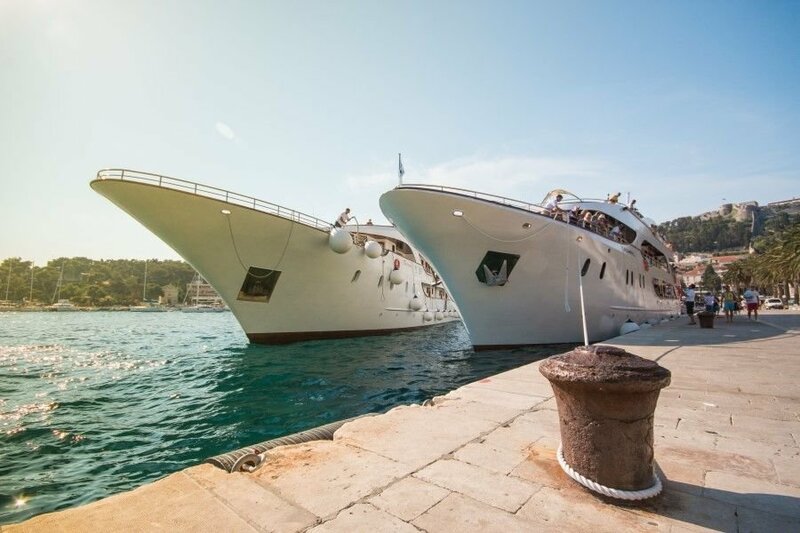 Before we tie the ropes at Gruž harbor cruise alongside the old Dubrovnik city walls while lunch is served on deck. After docking, transfer to the old town for the guided walking tour of this magical town. Take the cable car from the Old Town to Srđ mountain to enjoy scenic views of the Walls and Elaphiti Islands. For those with more enthusiasm, we recommend a walk on top of the 1940 m long city walls! Time at leisure for dinner and overnight in Dubrovnik. PLEASE NOTE: all tours can be combined with a great driving Tour through Croatia and/or Slovenija. Send us your special request and you'll get a suggested itinerary right away. we are back from the trip that you have arranged for us. We had a great time. Another great trip. Thank you for providing us with a fabulous tour! We all enjoyed it immensely and appreciated the hotels you arranged for us and the guide book, airline and train tickets etc. We will all remember this trip fondly for years to come! My brother Michael and his wife Dafnis also enjoyed the tour you planned for them in France in late May and they plan to contact you for their next trip!